We have come to drag days: Tis the season for fuzzy...uh...what? In the spirit of the holidays, I decided to review some of my most beloved presents through my years...growing up during the wonderful eighties! 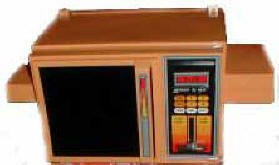 First up we have the Easy Bake Oven! Hey Mom and Dad, want this plate full of mush that's been sitting next to a 100-watt lightbulb for an hour? Mmmm! I loved "cooking" with this thing despite the fact everything turned out pretty gross. Look at it, though! It's a marvel. It looks like something that should be in Tron. It looks fairly terrifying actually. 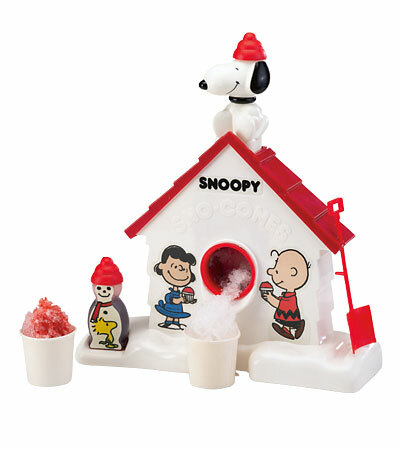 Next up we have the fantastic Snoopy Snowcone Machine! Look at that funny little guy from the band Devo on the left there. Actually Snoopy has the same hat on, too. Hm, which came first Devo's song Whip It or the Snoopy Snow Cone Machine? I always crack up Gabe while retelling the story of this toy. I would try to turn the ice crank but as I was a tiny toothpick I was never strong enough of course, so I'd make my dad turn the thing who all the while would be swearing JEEZUS! trying to get the crank moving. Good times! Okay third we have the fantastic...wait for it... Fuzzy Pumper Barber Shop. Huh? It was really called that?? It sounds like a brothel or something. This thing was so fun! Even though I don't think this barbershop ran as smoothly as the above photo depicted. So the way this worked--you put your little guy in the chair, turned the crank (an obvious theme in my childhood toys) and Play-Doh would come out of the holes in their heads. You could coif their hair using a plastic perm mold or trim it. I'm not making this up! Fuzzy pumpers. Yep. 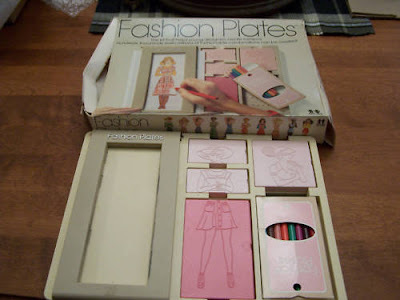 Last, but certainly not least I give you...Fashion Plates! The inspiration for this blog post, really. I had a dream about this toy; a toy I had long since forgotten but was obviously imprinted in my brain forever. It was my absolute favorite. Sort of like making paper dolls. You chose which plates you wanted to combine to create a swanky lady and outfit. The backs of the plates had patterns on them so you could get your outfit together and then color the clothes plaid, polka dotted or starry. Obviously I am not the only thirty-something lady dreaming about this toy because they sell on ebay for like fifty bucks! Ah the expensive price of nostalgia! I had both the snowcone machine and the... I had no idea the Plah-Doh chair was called that. That snowcone machine was ridiculous and messy, and now that I think about it, may have "disappeared" the way some of Violet's more annoying toys have disappeared when she has least expected. Im in my 40 and xant my child hood toy again to do with grand daughter i will hzve it again somefay cant forget about it seared i.to my brain!